We offer 32oz. and 64oz. growlers, as well as a 32oz. Crowler® (sealed in a can), with a constantly rotating selection of craft beer from high-quality breweries across the US. 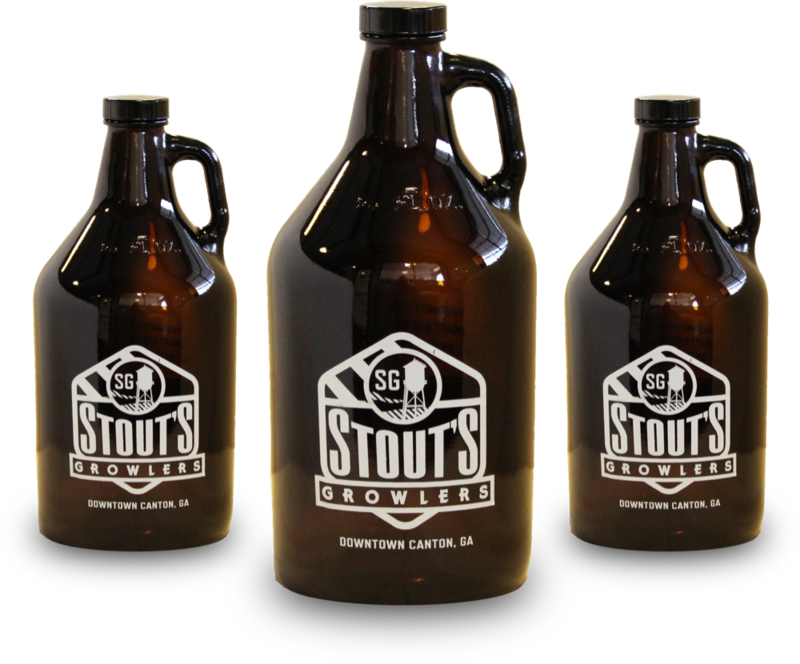 When you pick up your first growler from Stout's you purchase either a 32oz. or 64oz. glass growler for a one-time cost of $6 (in addition to the cost of the beer). The next time you come back, just bring your clean growler along and only pay for the beer you get. You can also swap a 32oz. growler for a 64oz. growler anytime at no cost. A Crowler®, in the simplest terms, is a mix between a can and a growler. You pick a beer from our tap selection and we fill a 32oz. Crowler® can and seal it up for you to take with you. A Crowler® is single-use and you pay for each Crowler® you buy. Our beer menu is constantly changing, so come on by and grab a pint or a flight to try out some of our new items. We will also have select wines available to enjoy by the glass on site. We'll have the TV's on and the music playing, so bring your friends and family and treat your palate! In addition to growlers, we stock bottles & cans from some of our favorite local breweries and from all over the world. We've built great relationships with local breweries to help promote our hometown heroes. Nothing makes a dinner or evening on the porch complete like a smooth glass of wine. We've hand-picked some of the finest wines around to sell in our shop, and would love to have you join us during a tasting night to pick out your new favorite bottle. In addition to our weekly pint nights, we host several events throughout the year, including First Fridays, the Art & Wine Walk and monthly wine tastings where we will typically open 5-6 bottles of wine and serve with light snacks. Bring your loved ones and friends for a wonderful evening in the heart of historic downtown Canton, GA. Check out the upcoming events below and make Stout's a part of your next date night! We're located at 188 North St. in the heart of historic downtown Canton, Georgia. As the only growler shop in Canton, Stout’s Growlers is proud to be a member of the downtown Canton community. As home brewers, owners Thery, Jim and Nick bring their love, passion and dedication for craft beer to the community and welcome you to stop by and enjoy any one of their 30 taps, bottles & cans and selection of fine wines.